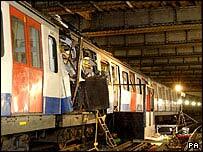 Survivors of the 7 July London bombings say they have had "productive" talks with the home secretary on holding some form of public inquiry. The survivors urged John Reid to hold a 9/11-style inquiry into why and how the attacks happened. The government has so far resisted calls for a public inquiry. But Rachel North, who was caught up in the blast near King's Cross, said there had been a "willingness" to listen and co-operate during the two-hour meeting. Monday's talks came as the government pledged an extra £2.5m in compensation for those injured or bereaved by the attacks. Ms North said Mr Reid had been adamant he did not want a "seven-year thing" along the lines of Northern Ireland's Bloody Sunday inquiry. However, she said the survivors wanted a new style of inquiry suited to the "post-7 July world", modelled on that held in the US into the 11 September attacks. It would look at social issues and foreign policy to establish why the bombings took place, she said. She said those caught up in the London bombings, in which 52 people died and hundreds were injured, would "keep pushing" to find out why, and not just how, the attacks took place. "The home secretary has said he's happy to keep engaging. He was very generous with his time," she added. Peter Zimonjic, who was injured in the Edgware Road bomb, said: "We are hopeful but we'll have to wait and see. "We started the meeting a way apart, and now we're a little closer." The meeting was the first time Mr Reid had come face-to-face with survivors of the bombs as home secretary. Earlier, a Home Office spokeswoman said about 500 victims of the bombings had so far made claims to the government's criminal injuries compensation scheme, with payouts ranging from £1,000 to £118,000, and totalling more than £2m. The promise of a further £2.5m in compensation contrasts with the stance taken by previous Home Secretary Charles Clarke, who rejected calls for extra compensation payments for the victims of the attacks.